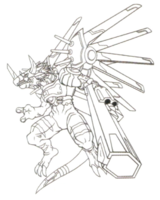 A Cyborg Digimon that has mechanized over half of its body. In spite of its large build, it flies to the sky to attack the enemy. The offensive power of the shots fired from the gigantic revolver on its left arm is said to rival that of a single nuclear warhead, and it is normally impossible to rapid-fire due to its tremendous power and recoil. 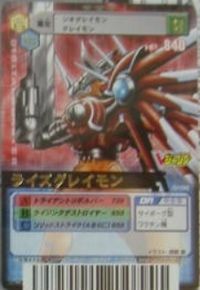 In order to withstand that power, its gun barrel is made from Chrome Digizoid. 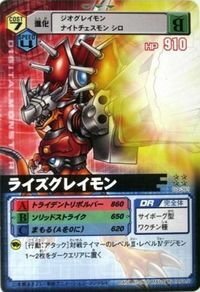 Its Special Moves are a high-speed rapid-firing at the limit of the Chrome Digizoid's endurance (three bursts) (Trident Revolver), and firing a beam barrage from its chest-cannon and the three beam cannons extending from its wings (Rising Destroyer). Also, its "Solid Strike", in which it charges at the opponent and knocks them out with its gigantic revolver, has extraordinary impact strength. 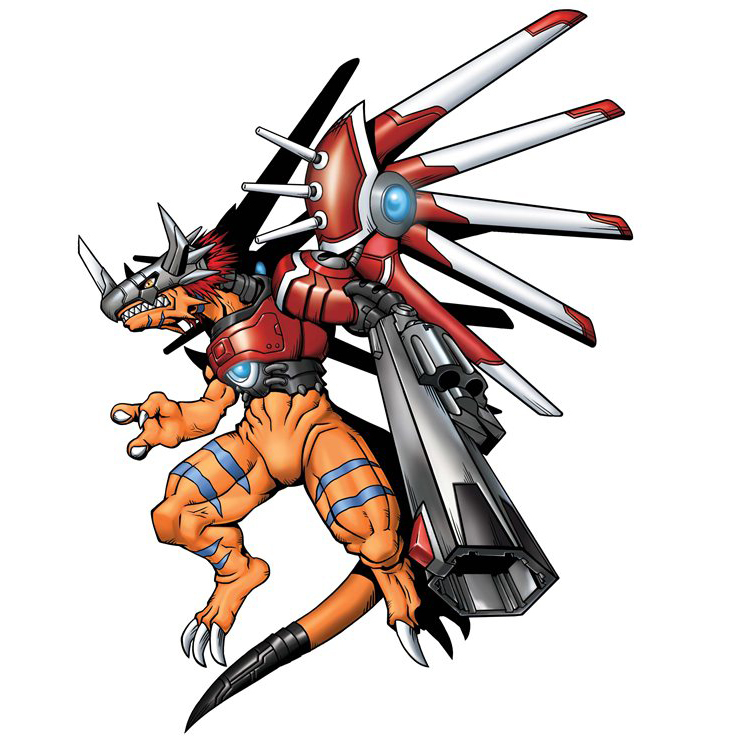 — Digimon Savers: "Masaru's New Power, Evolve! 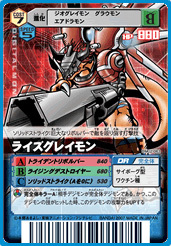 Rize Greymon"
A Cyborg Digimon that has mechanized more than half of its body. Despite its large build it flies to the sky to attack the enemy. A misspelling of rise[N 1] 「ライズ Raizu」. 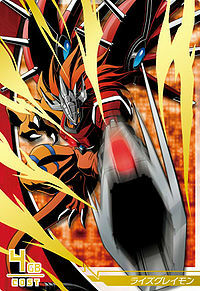 Anime/Manga Digimon Savers: "Masaru's New Power, Evolve! 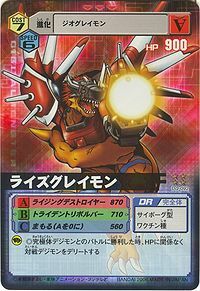 Rize Greymon"
Trident Revolver  トライデントリボルバー Toraidento Riborubā Rapidly fires three rounds from its revolver. Rising Destroyer  ライジングデストロイヤー Raizingu Desutoroiyā Fires beams from its chest-mounted gun-ports and the beam cannons on its wings. 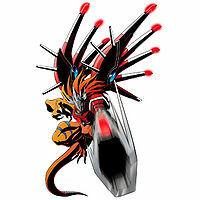 Barrel Smash  バレルスマッシュ Bareru Sumasshu Attacks with its Chrome Digizoid gun barrel. Barrel Blow  バレルブロー Bareru Burō A stronger version of Barrel Smash. Heavy Barrel  ヘビーバレル Hebī Bareru Uses the barrel to strike the enemy with all its might. Fires a barrier-piercing bullet in the shape of a key. Solid Strike  ソリッドストライク Soriddo Sutoraiku Knocks an enemy out by hitting them with the revolver. Rize Greymon is the partner of Daimon Masaru. 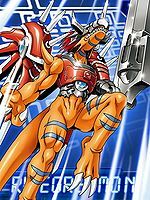 After Masaru's mother and sister are hurt in an attack by an out-of-control Garudamon, his DigiSoul increases, causing Perfect Evolution. 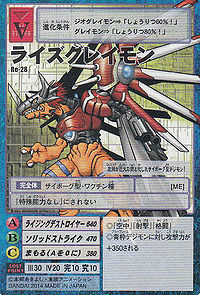 Geo Greymon evolves to Rize Greymon, blasting Garudamon and returning it to a DigiTama. Can be evolved from Geo Greymon if above level 29 and Dragon EXP above 2000. 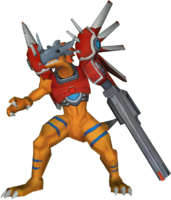 Rize Greymon is an obtainable evolution of Agumon. 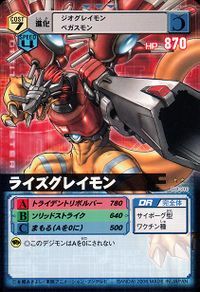 Rize Greymon is a #256 Digimon and it's a Perfect-level, Balance-class, Dragon-species with a resistance to the Fire element and weakness to the Earth element. Its basic stats are 220 HP, 247 MP, 138 Attack, 108 Defense, 93 Spirit, 110 Speed and 55 Aptitude. It possesses the Powerful 4, Fire Aura 4, and EX Damage 3 traits. 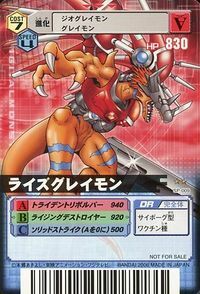 Rize Greymon evolves from Geo Greymon and can evolve into Shine Greymon or Dot Shine Greymon. 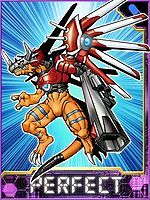 In order to evolve or degenerate to Rize Greymon, your Digimon must be at least level 35, with 3500 Dragon experience and 3500 Machine experience. 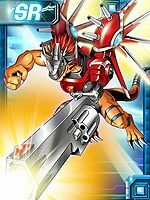 Rize Greymon can jogress from Flare Lizamon and Revolmon, if the base Digimon is at least level 30, with 2000 Machine experience and 2000 Dragon experience. 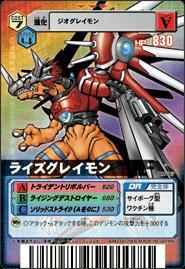 Rize Greymon can jogress into Imperialdramon: Dragon Mode with Allomon. 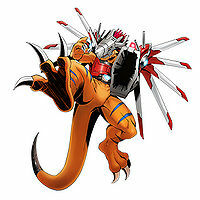 It is available as a partner in Balanced starter pack for Digimon Story: Sunburst. 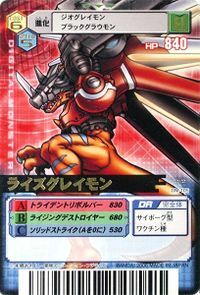 Rize Greymon is an obtainable Digimon which is evolved from Geo Greymon or Guardromon, and can evolve to Shine Greymon or Victory Greymon. It can also be obtained as a collectible card. 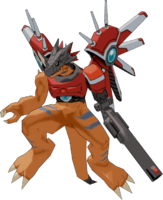 Rize Greymon can evolve from Aquilamon, Gaogamon, Geo Greymon, Numemon, or Sunflowmon. Can evolve to Demon, Mirage Gaogamon,Rosemon, Seraphimon, or Shine Greymon. 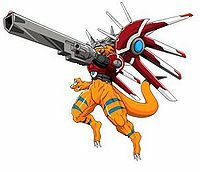 Rize Greymon can evolve from Gaogamon, Gawappamon, Geo Greymon, Karatuki Numemon, Peckmon, or Reppamon. 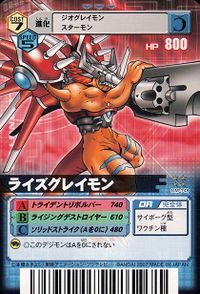 Can evolve to Jumbo Gamemon, Mirage Gaogamon, Ravmon, Shine Greymon, or Sleipmon. 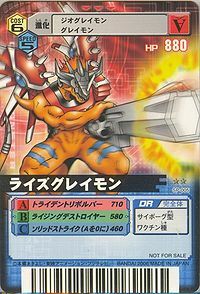 Can also Burst Evolve into King Chessmon or Shine Greymon. 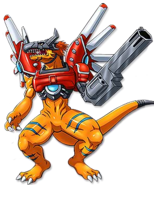 Rize Greymon can evolve from Geo Greymon or Vegimon. Can evolve to Shine Greymon. 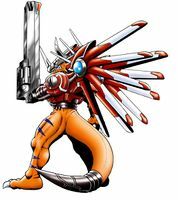 This Cyborg type Digimon's left arm has been converted into a huge gun! Solid Strike: A striking technique in which it beats the enemy down with its gigantic revolver. Over half of its body has been mechanized, bestowing upon it the ability of flight. 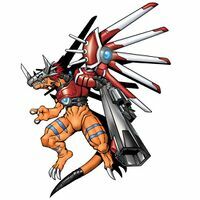 It is able to dance freely in the skies despite its large size, and it attacks with the Chrome Digizoid revolver equipped on its left arm. ↑ Digimon Savers: "A New Power Emerges. Evolve! 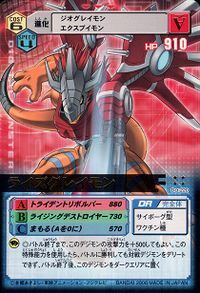 Rize Greymon"
↑ Rise, in conjunction with shine, a reference to Shine Greymon, may be a pun on the phrase "Rise and shine".